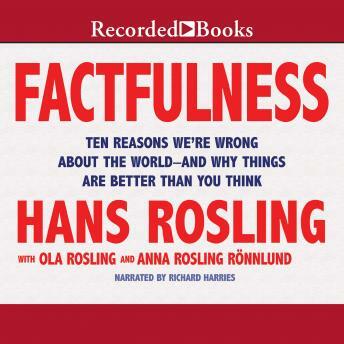 Factfulness: The stress-reducing habit of only carrying opinions for which you have strong supporting facts. When asked simple questions about global trends-what percentage of the world's population live in poverty; why the world's population is increasing; how many girls finish school-we systematically get the answers wrong. So wrong that a chimpanzee choosing answers at random will consistently outguess teachers, journalists, Nobel laureates, and investment bankers. Factfulness is an urgent and essential book that will change the way you see the world and empower you to respond to the crises and opportunities of the future. Brutal monotone narration. Subject matter not much better. How can you lecture and write an entire book about a dozen factoids (that are easily googled, I might add) as if you’ve discovered the Holy Grail? Author full of himself. I could not stay awake after 2 hours of this pain. Wasted $15. This was a great book! A little dry because it focused so much on 13 questions; but it quickly went into explanations of why we think and generalized the way we do. It maid me question my judgements of the world view.